RÉSONAANCES: April Fools' 16: Was LIGO a hack? Hah, you absolutely got me there, that was very good. You had there for a minute -- until I said "seriously?" out loud, and another part of my brain answered. Actually, this post is a hack. Jester has posted on his twitter account that his blog has been compromised. He is currently working with the blog hosting company to wrest back control. He expects to have the situation resolved around midnight this evening. Hah, I fell for it for a minute. Was getting disappointed and trifle upset till I remembered what day it was. @Anonymous: It gets worse, the hacker also hacked the twitter account and deleted this tweet! It would be really cool if they could hack us some long awaited super symmetry - maybe next year?! 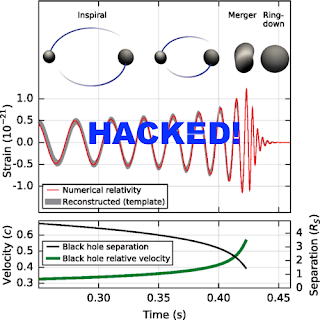 This is actually not so crazy - according to the LIGO team, a malicious hacker was actually one of the possibilities they considered and checked for before announcing the results! The best lie is the one everybody wants to hear. Politicians are masters in it. Before announcing a 5 sigma effect, you check everything. I think it's really a lie. This article is too silly. This comment is too silly. It is no true that the LIGO signal was in a book, it did came as a surprise.